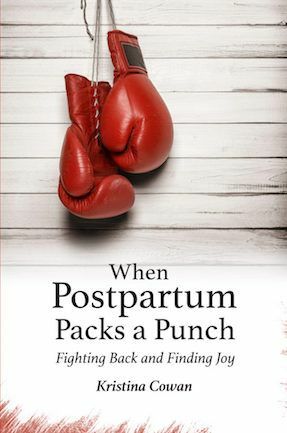 When Postpartum Packs a Punch offers solace to mothers who have faced traumatic birth and perinatal mood disorders, as well as a chorus of different voices—parents, experts, and researchers. All are singing the same song: while the U.S. has made strides in caring for new mothers, we still have far to go. Stigma silences women, and blinds those on the sidelines. Stories of others’ struggles are an antidote for stigma, because they let mothers know that they’re not alone. Kristina Cowan describes her own experience with traumatic birth and postpartum depression, and weaves it together with stories from other parents. Representing diverse backgrounds and perspectives and underscoring the prevalence of mood disorders after childbirth, these stories serve as a balm. They help heal and stir hope. And they show how an overcoming spirit can fight terrors of the mind—and win. Read Publishers Weekly‘s review of my book, on the website, or in the catalog. Learn more about why I wrote this book. Watch Mark Williams’ interview with me about writing When Postpartum Packs a Punch, and how men are affected by perinatal mood and anxiety disorders. Read my guest column in the Daily Herald, about the prevalence of perinatal mood and anxiety disorders and how survivors can help those struggling.